We visited Duke Gardens late Sunday morning. The light was bright for taking pictures, but I did anyway. 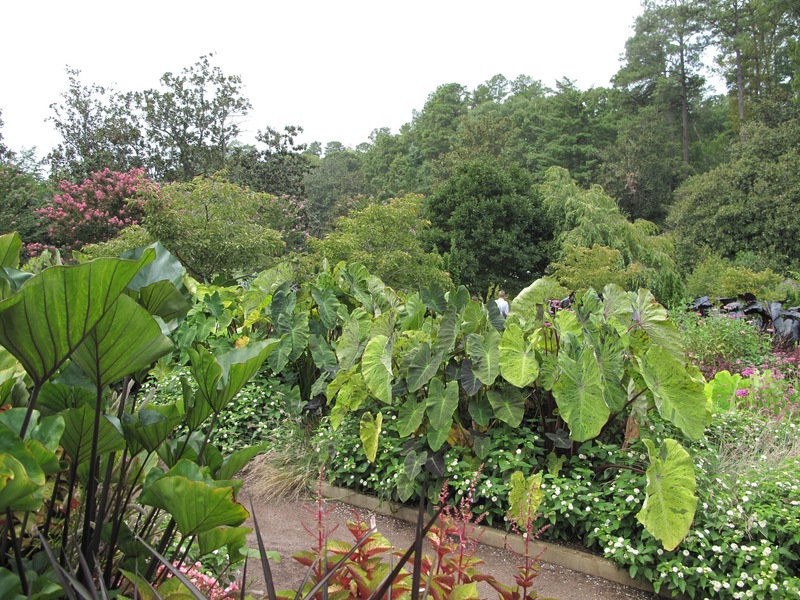 The terrace gardens were packed with interesting plants, some flowering, some not, and the Colocasia (elephant ear) were especially wonderful. 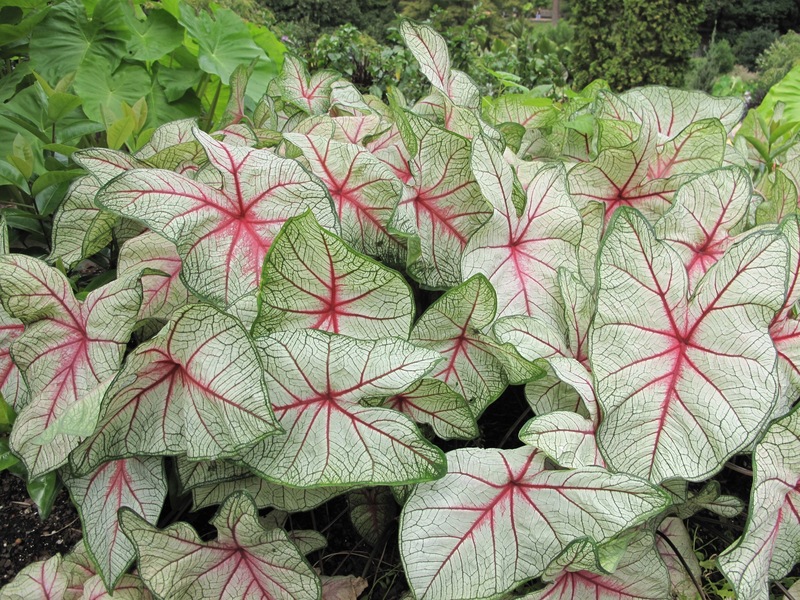 These Caladium were lovely as well. 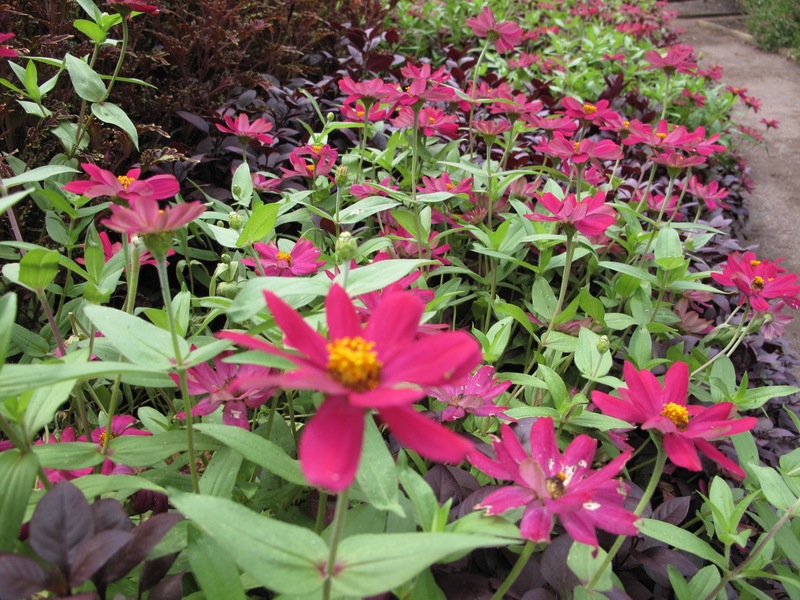 There were lots of zinnias interplanted with foliage plants for contrast, a fancy Echinacea ‘Southern Belle’ and a beautiful purple Clematis(?) for which I could not find a label. 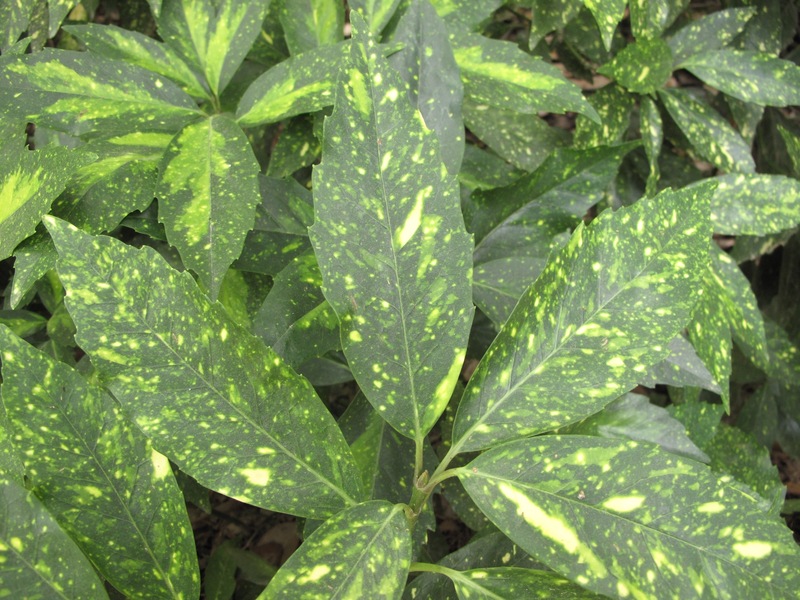 Off to one side a hedge of Aucuba had lovely patterns in the leaves. (I think I have an answer to this question now. 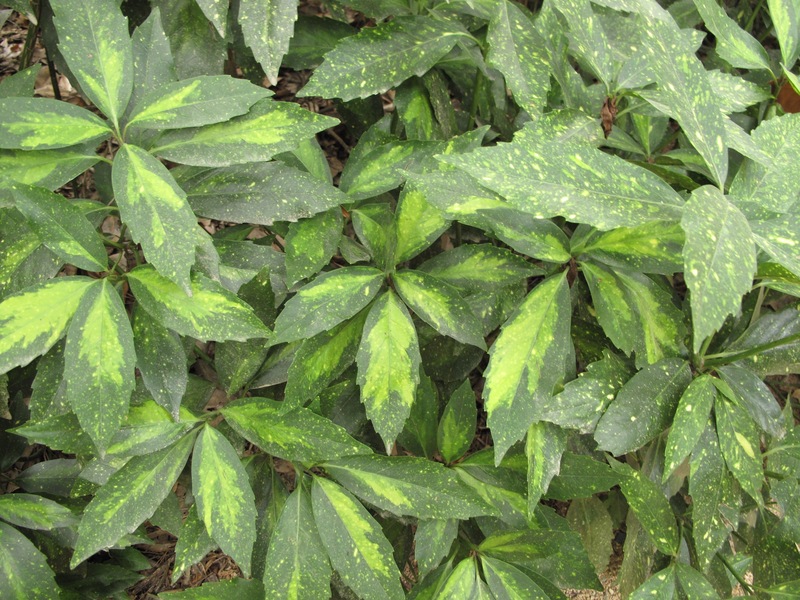 See below) Does anyone know what this plant is on the left? I like the cool pods and can imagine using them in an arrangement. 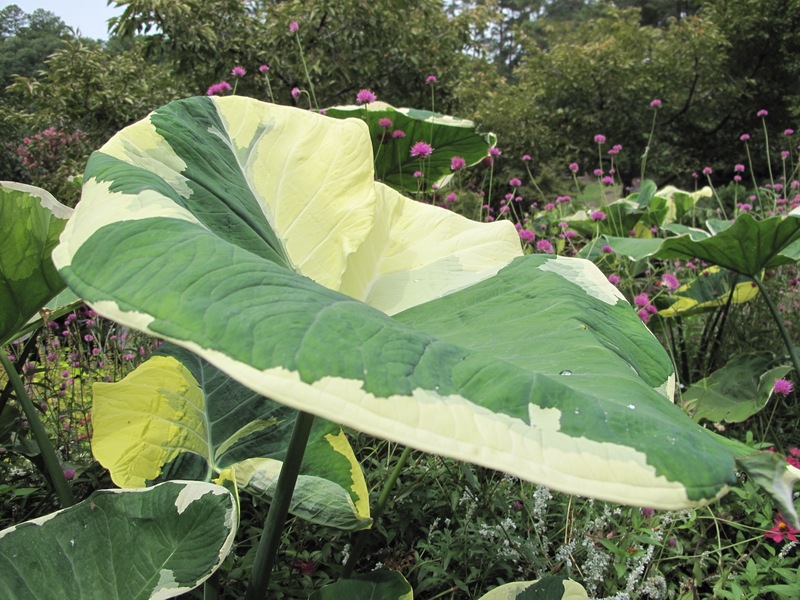 Update: The pod source is Datura metel ‘ Double Purple’ – Devil’s Trumpet. Christina’s comment made me take a second look at a photo of the planting placard from that border. 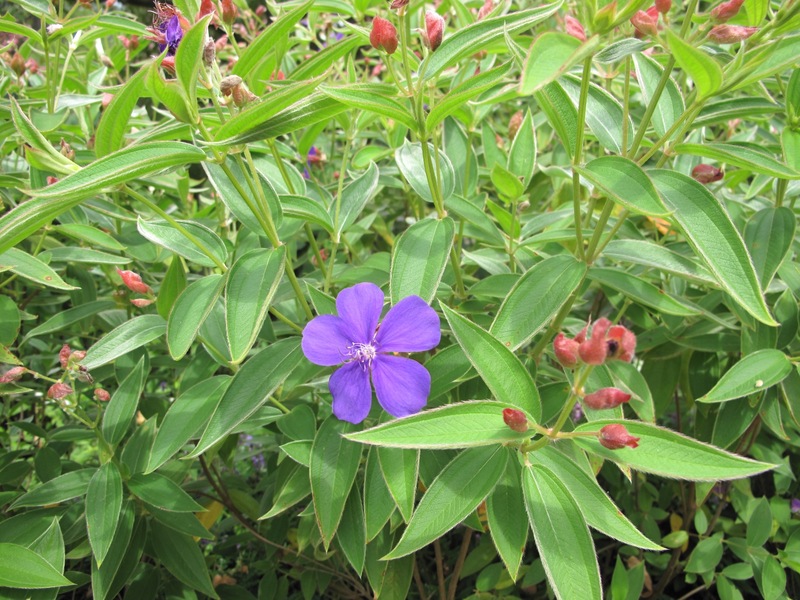 This one was in bloom in a different border (so may not be ‘Double Purple’), but matches the plant in question. 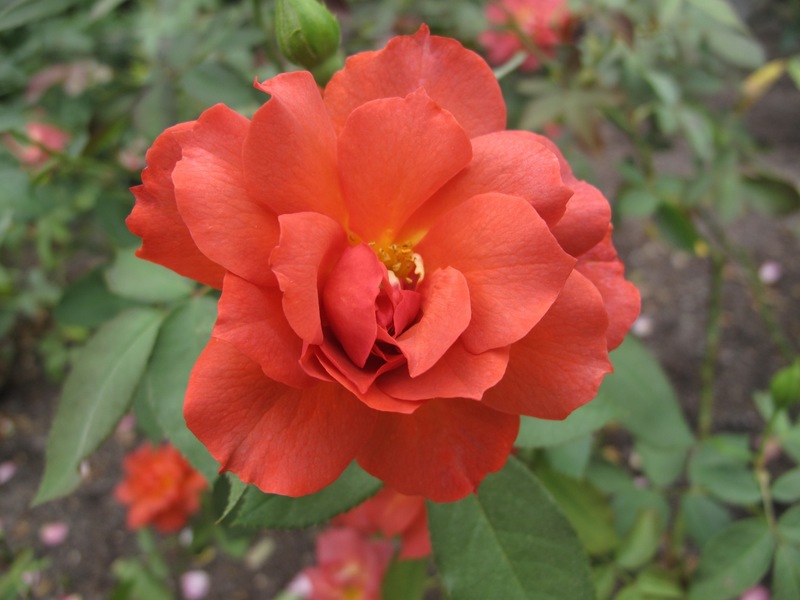 Passing through the rose garden as we were leaving I was taken with the color and fragrance of this rose. 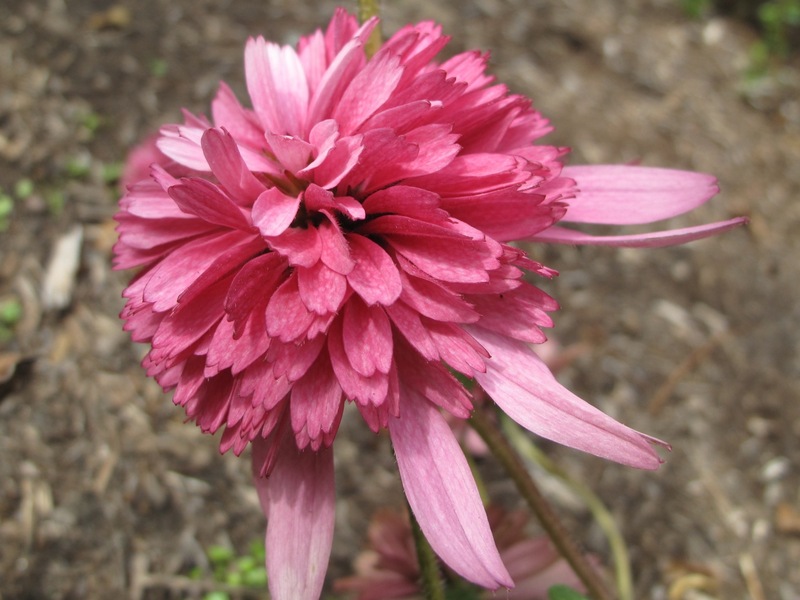 Each flower had subtle color variations, some more subdued than others. Oh, and we finally found the bird shelter. Before entering the terraced garden we had made a point to search for it and to stop there awhile. Cardinals, nuthatches and chickadees flitted in and out while we sat high in the trees. We also saw a pair of woodpeckers and possibly a brown thrasher. The garden covers many acres and we saw just a small fraction this day. It is always a delightful place to spend some time. 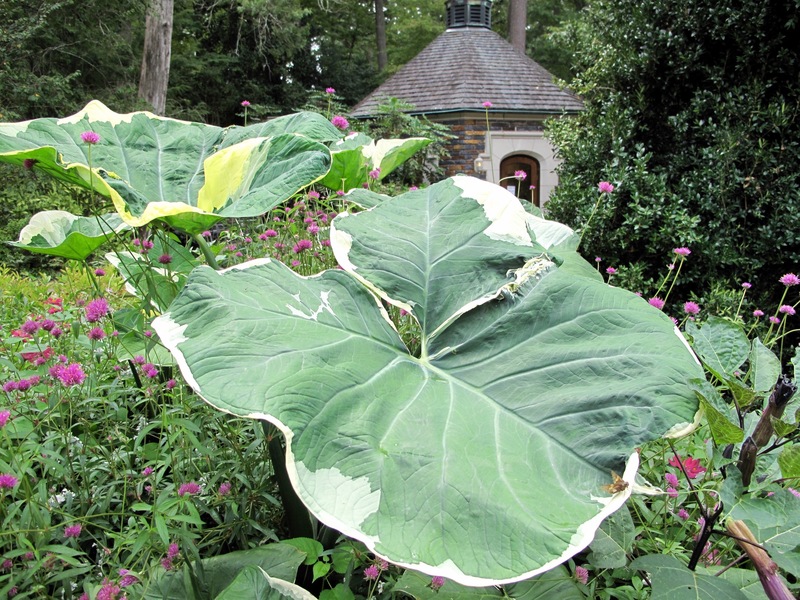 This entry was posted in garden and tagged Colocasia (elephant ear), Sarah P. Duke Gardens on September 1, 2015 by pbmgarden. Well done for finding the hide, were we anywhere near it? 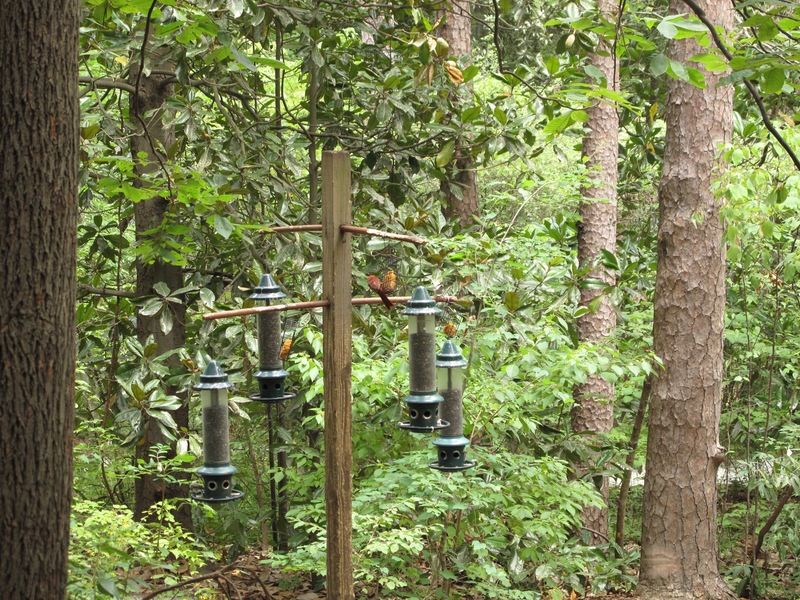 the view looks similar towards the bird feeders. The pod does look to be an ideal candidate for a vase, it is similar to a Daura seed pod but the leaves aren’t similar so I don’t think it is that. Lovely memory of Duke’s, thank you. Yes, we were right there at it, but it was certainly well-hidden from us that day. The humidity was almost as bad Sunday as the day we went together, but at least it wasn’t 100F/37C. 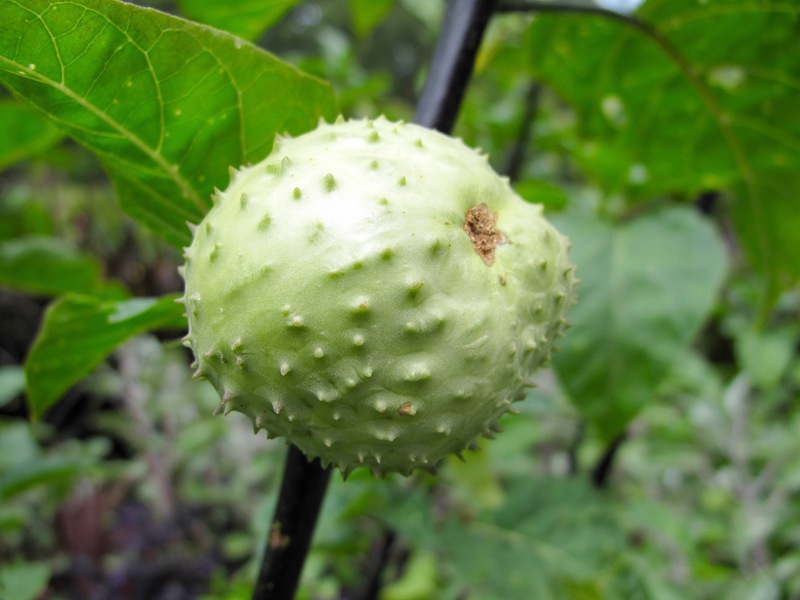 Is Daura the same as Datura? 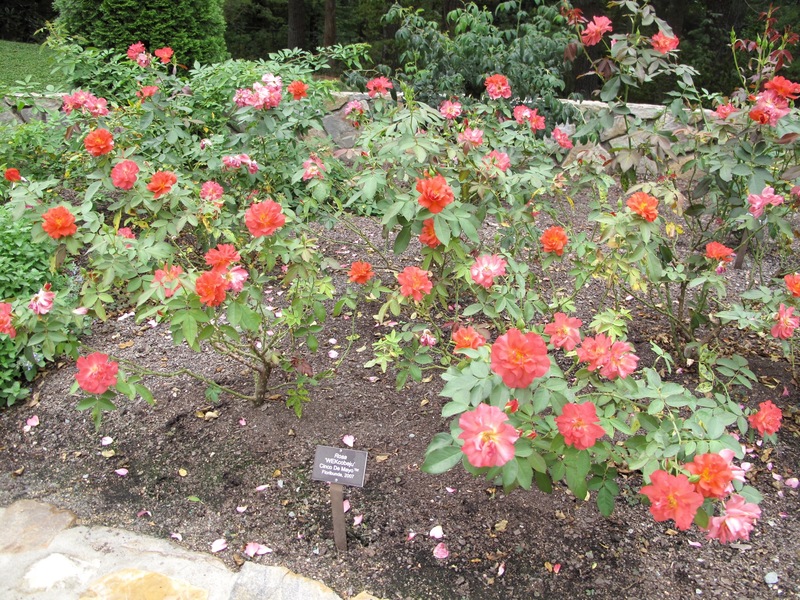 There was a sign listing 5 plants growing in that border, but I didn’t find a match on any of them when I looked them up. But with your clue, I looked again. 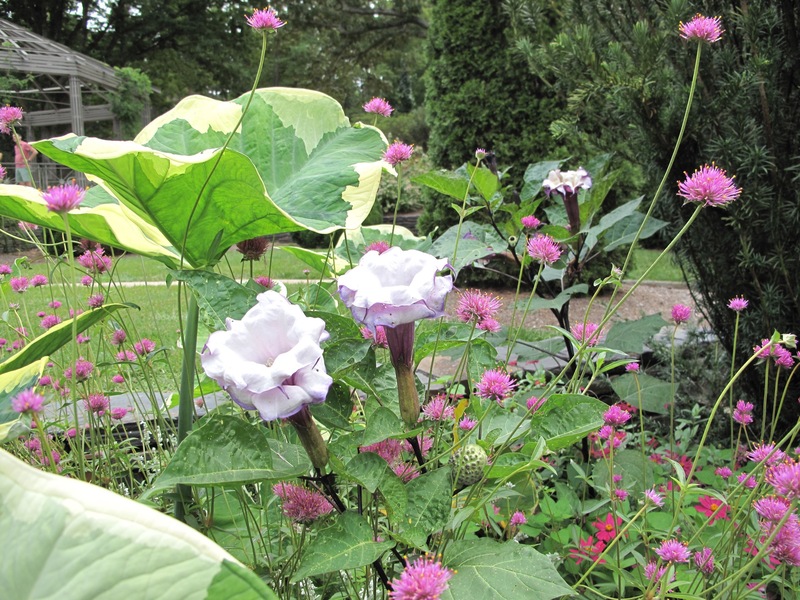 It must be Datura metel ‘ Double Purple’ – Devil’s Trumpet. I have a photo from a different border that I just added to the post. That must be the Datura in flower along with a pod, so thanks for the help. I thought this garden was familiar and now see by reading Christina’s comment you have shown us other seasons here. The pod plant though is not familiar, it does look quite dramatic. I hope you find the answer Susie. 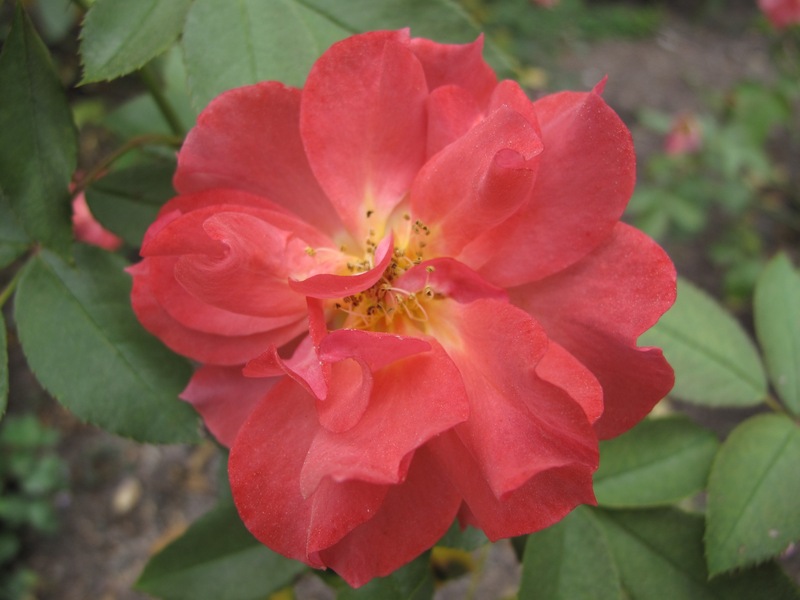 I very much like the rose colour and shape and could definitely find a home for that one here. Hi Julie! 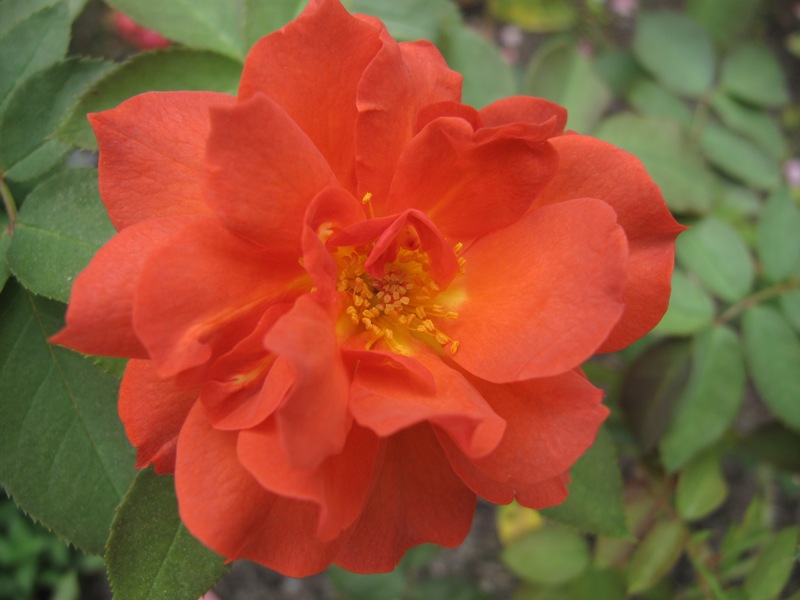 Nice little rose, isn’t it. Yes, I’ve shown this garden before several times. It’s close by so we can visit it often and there’s not much to look at in my garden this time of year. 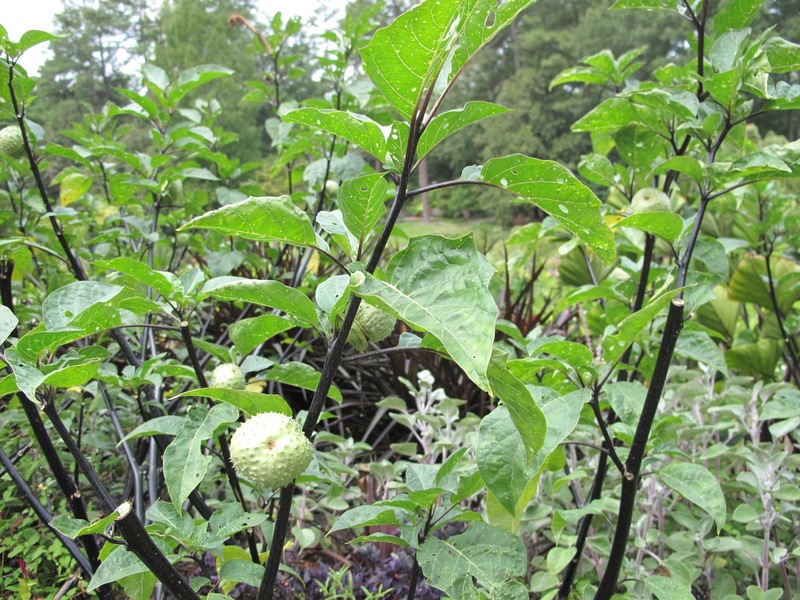 The pod seems to be Datura metel ‘ Double Purple’ – Devil’s Trumpet. 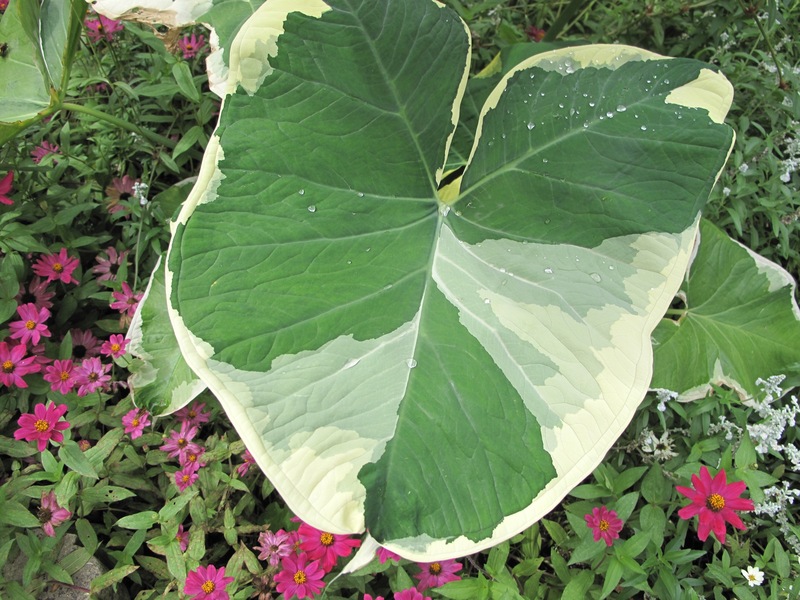 Those are some spectacular foliage plants, especially the variegated colocasia. 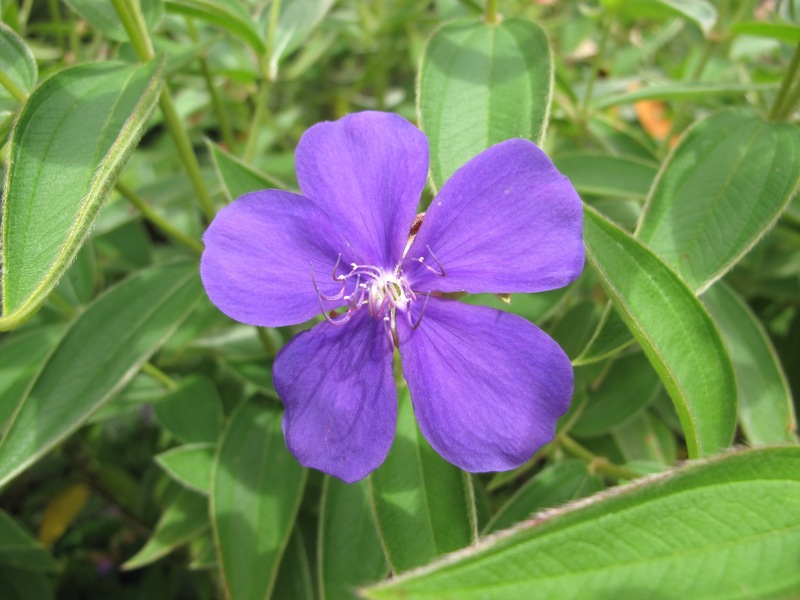 Thanks for your offering–I went back through my photos and found a similar plant in bloom. Seems to be Datura metel ‘ Double Purple’ – Devil’s Trumpet. 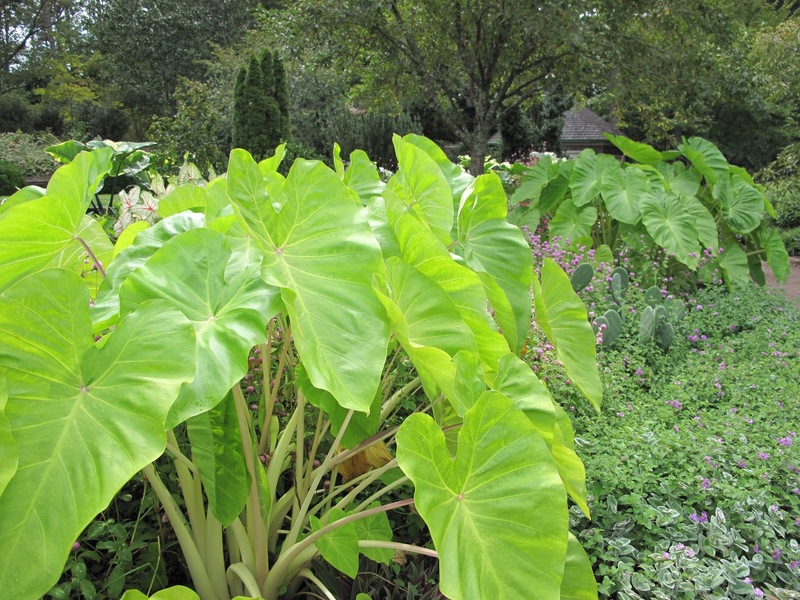 Those colocasia are amazing. I let one of my Datura go to seed and the pods look a lot like that, even though it’s a different variety. The pods burst and spew seeds earlier that one would guess…which reminds me to get out there and scoop up the seeds for next year. That looks like a special place, worth repeated visits. 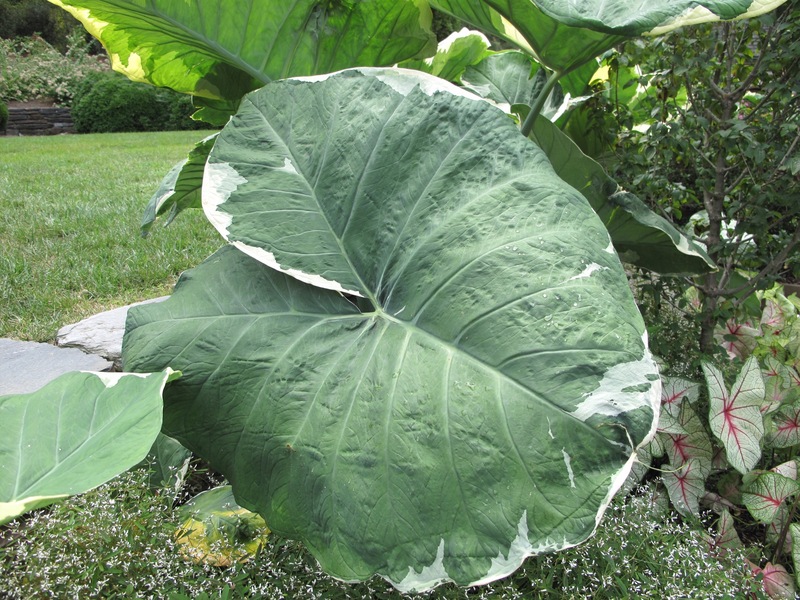 The Colocasias are sure dramatic in masses like that. Yes, better get the seeds picked up or you’ll have Datura everywhere. Had never heard of or at least paid attention to Datura before this year. It seems many people grow it. 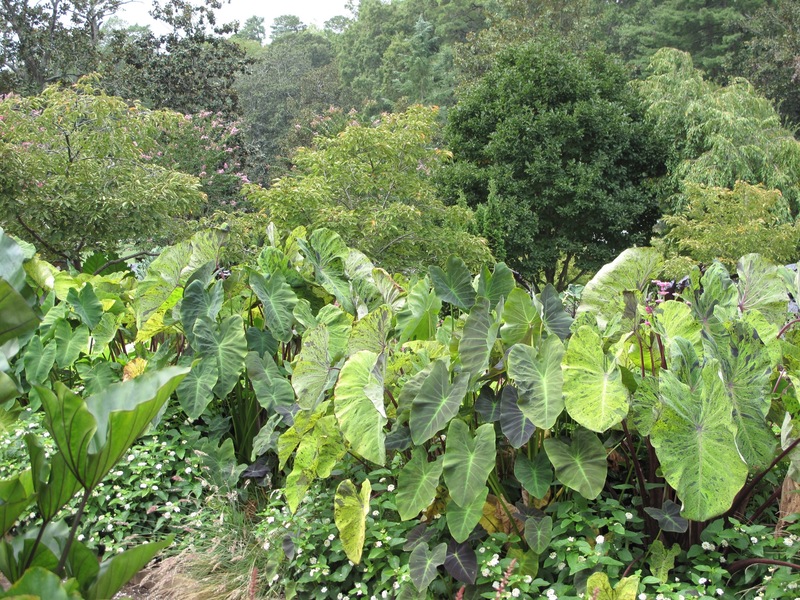 I couldn’t keep my one Colocasia alive through this summer’s drought, so it was fun to see the massive planting at Duke. 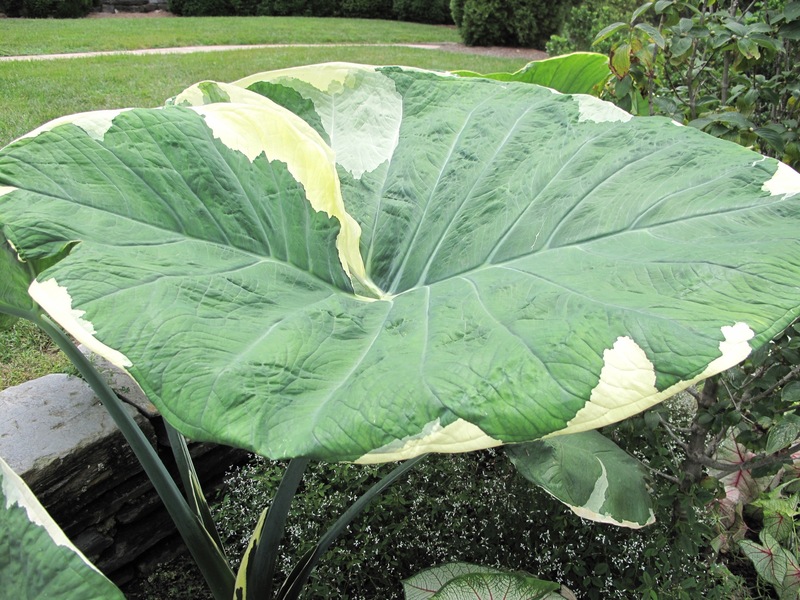 Those Elephant Ears are huge! I love Caladiums. I didn’t plant any this year, but I love them. Looks like you had a great visit. Those elephant ears are indeed huge. This is a nice garden to visit. It’s very close to where we live (1/2 hour) so we can go for short periods and see a little at a time. Caladiums don’t do well for me but I do like them too Beth. 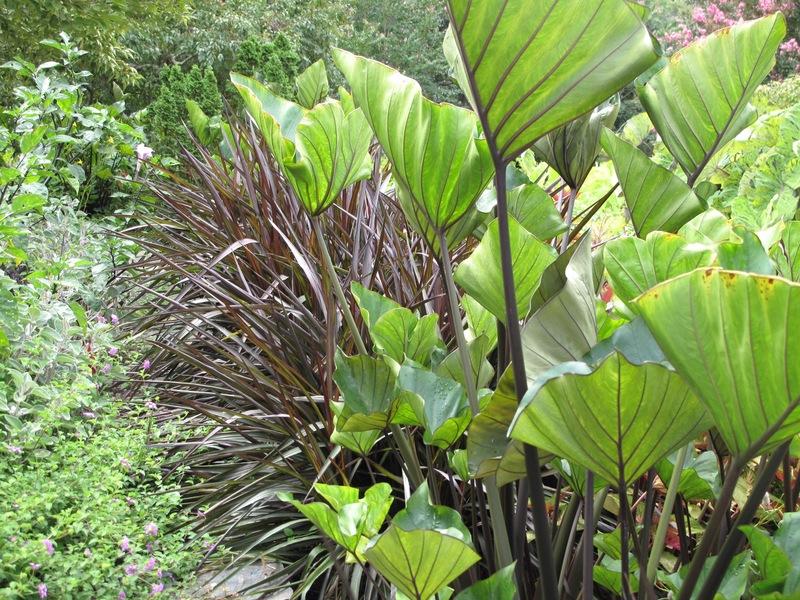 Gorgeous plants, where are these gardens? I’m not sure I’ve heard of Duke. It is located in Durham North Carolina. This part I showed is one tiny aspect of it. 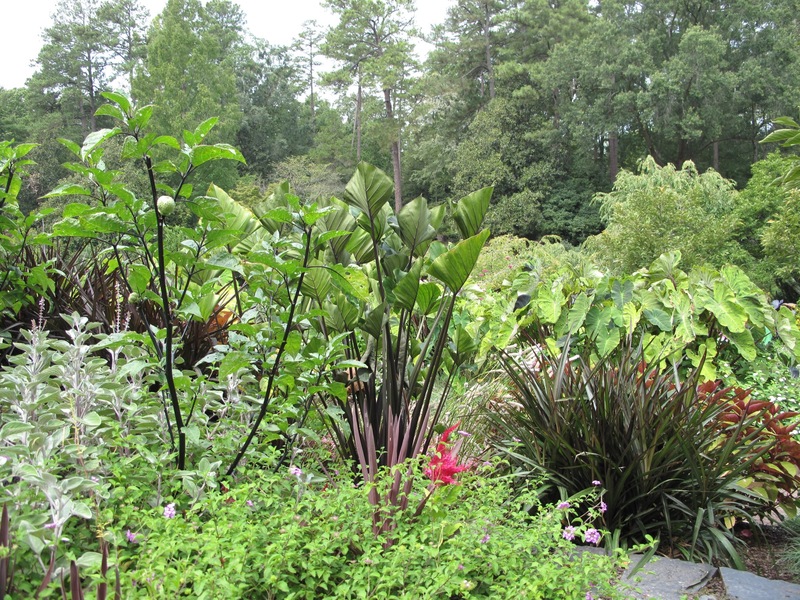 I love tropical gardens, and this one looks especially nice. Sometimes public gardens seem a little too formal and planned, but here the plants all seem comfortable and I like the color combinations! The terraced gardens seem very formal at other times of the year, but in summer it does seem more casual.